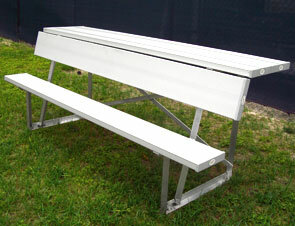 The aluminum Team Bench with backrest is perfect for baseball dugouts. This dugout bench features a rear shelf especially useful for holding baseball mitts, extra baseballs, batting gloves, and players can even sit on it for a higher view of the game. The aluminum angle frame understructure makes this dugout bench ideal for placement on level surfaces. The high strength to weight ratio 6061-T6 aluminum allow extrusion back, seat, and shelf planks are naturally resistant to corrosion. Included galvanized hardware will not rust. 6', 7-1/2', 8', 15' or 21' Bench Lengths. Can be Surface Mounted to a Level Surface.